Adorn your child's playhouse with this printed canopy to elevate their personal space with adore. It is perfectly shaped like a house canopy and is spacious enough to add curtains or string lights. Furthermore, the canopy is made from the highest safety standards. 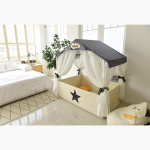 The product images have a crib and bedding used for illustrative purposes. The product is Ggumby Play House Canopy.